I recently came across a nice article by Colin Eberhardt on automatically adjusting clipping bounds whenever the element to be clipped was resized, and I decided to make some small additions to make it work with rounded corners for a project I’m working on. Since Colin was generous enough to share his code, I’m going to share my additions as well. Colin’s solution involves the creation of an attached property called Clip.ToBounds (a bool) applied to the item whose bounds you want to serve as a clipping path. When this property is attached, it adds a listener to the Resize event and updates the clipping path when this happens. Simple but effective. I’ve added two more attached properties: Clip.RadiusX and Clip.RadiusY. The attached Clip properties are defined on the Grid control. 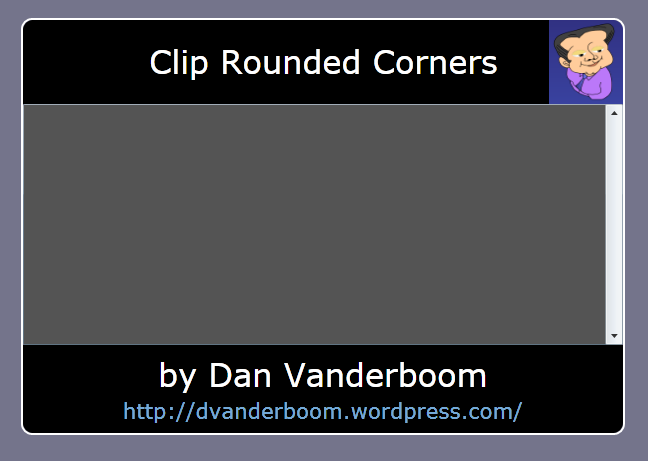 Even though the Border defines its own CornerRadius, it’s the Grid within it that needs to set the clipping path. Within the Clip class, I’ve updated the ClipToBounds method to set the RadiusX and RadiusY properties of the RectangleGeometry object used to set the clipping path. The complete Visual Studio 2010 (Silverlight 4) demo project can be downloaded here. Resize your browser to see ContentView resize. The clipping path updates like you’d expect it to.